Erbil, Asharq Al-Awsat—Iraqi troops who fled the advance of Islamic State of Iraq and Syria (ISIS) fighters into Mosul have denied that they abandoned their posts, saying that they had received orders to flee from up the chain of command. Iraqi military forces have received strong criticism after ISIS was able to advance into and occupy large parts of the country this week, including the country’s second largest city Mosul. Reports from the ground said that Iraqi soldiers did not put up a fight, abandoning military posts and arms and even trading military uniform for civilian clothes. International media reported that two division of Iraqi soldiers—roughly 30,000 men—fled an insurgent ISIS force of approximately 1,000. “We are not deserters. Our commanders abandoned us while we were sleeping at night, and fled by helicopter,” Mahmoud Fahd, an Iraqi soldier who survived the ISIS attack told Asharq Al-Awsat. “When we woke up in the morning, there were no [military] officials at the post. Our officers told us to put on civilian clothes and return to our families,” the Iraqi soldier added. The humiliating retreat raised the possibility that senior Iraqi military leaders were colluding with ISIS, particularly following reports that former regime figures—including outlawed Ba’athist party leader Izzat Al-Douri—had been seen alongside the radical Sunni Islamists. Fahd accused the General Commander of Iraq’s Land Forces Lt. General Ali Ghaidan Majid and Nineveh Operations Command chief Mahdi Al-Ghrawi of treason. On Thursday Kurdish forces—known as the Peshmerga—announced that they were fully in control of the oil-rich province of Kirkuk in a bid to contain the ISIS advance. 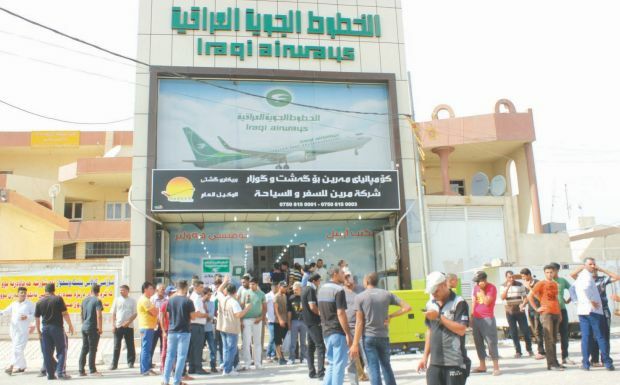 Iraqi soldiers gathered in front of the Iraqi Airways office in Erbil on Friday seeking tickets to leave the Kurdistan Region; the road to Baghdad is under direct threat from ISIS and other radical militias. “The road is unsafe as fighters from ISIS and other groups are setting up checkpoints and killing every military or police officer they find,” Iraqi soldier Jasim Abdul Hussein told Asharq Al-Awsat. Hussein Zeidan, a soldier affiliated to the second division of the Iraqi army tasked with securing Nineveh province, told Asharq Al-Awsat that Iraqi military forces did exchange fire with ISIS fighters prior to the fall of Mosul, contrary to media claims. “We were on a night mission and clashed with ISIS fighters and managed to liberate the Nineveh hospital and the old hotel. When we needed reinforcements to maintain our advance, our commander contacted the chief of military operations in Nineveh but he did not respond and so we had to turn back,” he said. Zeidan also accused Iraqi Land Forces commander Ali Ghaidan and Nineveh Operations Command chief Mahdi Al-Ghrawi of ordering officers to abandon their posts, saying they had left Iraqi troops stranded in Mosul without orders. “We were completely surrounded by ISIS and would have been killed were it not for the Peshmerga forces,” he said. The Iraqi Ministry of Defense has said it will offer free flights back home to soldiers stuck in Erbil. However not all Iraqi soldiers were able to flee the ISIS advance, with local and international media reporting that the militant group killed hundreds of soldiers. “The full extent of civilian casualties is not yet known but reports received by UNAMI, the UN mission in Iraq, to this point suggest that the number of people killed in recent days may run into the hundreds and the number of wounded is said to be approaching 1,000,” a UN spokesman Rupert Colville told reporters in Geneva on June 13. The statement came following reports of some 1,700 Shi’ite soldiers being executed in Tikrit after they surrendered to ISIS.